This mouse is quite possibly the cutest stuffed animal e.v.e.r. Catalina Mouse could be yours if you win this giveaway! Our jealousy is in full force now. For reals. And did you SEE the other little characters Hazel Village has?! Reginald Fox, Sidney Toad, Evangeline Frog…. Pssssst. All Modern Bliss members get free shipping until March 15 with the code MODERNBLISS. Sometimes the other animals ask Catalina, doesn’t that bonnet constrict your ears? She says, thank you for asking but in fact no, it is cozy and it stretches. Plus, when she finds nice acorns she can use her bonnet as a bag. Catalina is made of grey organic cotton jersey, and stuffed with washable fiberfill. Her ears are lined with cotton oxford shirting. Her eyes and nose are hand-stitched with cotton embroidery floss. She measures 13.5 inches, not counting her ears and tail. She has a beanbag in her torso, the better to sit up. Catalina’s elastic-waist skirt is made of turquoise silk. 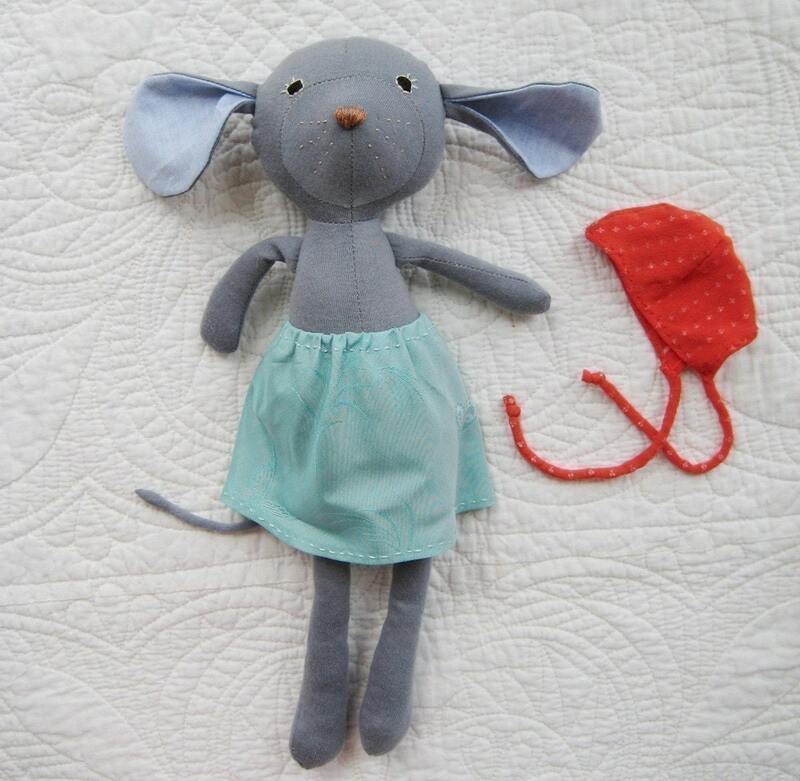 Like all Hazel Village animal clothes, Catalina’s skirt and bonnet are removable so the animals can share and trade. Your Catalina will be made to order. She will travel to you in a reusable cotton bag, with a lavender and mint sachet tucked inside. She is excited for the journey because in general she likes burrows, and she fits in the shipping carton perfectly. In the pictures Catalina’s skirt has a brocade pattern if you look closely, but I’ve run out of that fabric. I found a replacement piece of plain silk with the same lovely color and texture, and that’s what your Catalina’s skirt will be made of. You MUST post a SEPARATE comment per entry method. If you list them all in one, they will only count as one entry! Post this (or something similar) to your Facebook and/or Twitter (do both and get two entries): I just entered @modernbliss1 Anniversary Giveaway! http://bit.ly/erePtG -or- hit the share link at the bottom of the post - Add a link to your post in your comment! The contest closes on Friday, February 18, 2011 at 11:59 pm. Check back on Monday, February 21, 2011 to see a list of winners! Click HERE to see a list of all giveaway items! sooo cute! love the rabbit too! i added shop to favorites on etsy! OMG this can not be any cuter. Really. Adding shop to my faves on etsy, for sure! LOVE!!!!!!!!! And Hazel Village is from Brooklyn, YAY! FAved her on etsy! Already like MB on FB. Love sidney the toad too. Love the mouse. She is adorable! I liked MB on FB. I added this shop to my Etsy favorites. So cute!!! I want to win!